JAMES PARRY I (Source: John Winter-Lotimer.). i. JAMES PARRY II, b. 1764; d. 1833. JAMES PARRY II (JAMES I ) (Source: John Winter-Lotimer.) was born 1764, and died 1833.
i. JAMES PARRY III, b. Abt. 1799, Chester; d. 1884. JAMES PARRY III (JAMES II , JAMES I ) was born Abt. 1799 in Chester, and died 1884. He married ANN ROBERTS (Source: John Winter-Lotimer.). She was born Abt. 1811 in Chester, and died 1896.
i. MARY ELIZABETH ?? PARRY, b. Chester. iii. CATHERINE PARRY, b. Abt. 1837, Chester; d. 1886.
iv. HANNAH PARRY, b. Abt. 1841, Chester; d. 1861.
v. ALBERT ?? PARRY, b. Abt. 1843, Chester; d. 1896.
vi. GILBERT J PARRY, b. 1844, Chester; d. 1903. ALBERT ?? PARRY (JAMES III, JAMES II , JAMES I ) was born Abt. 1843 in Chester, and died 1896. He married MARY ELIZABETH ROBERTS (Source: John Winter-Lotimer.). She died 1891.
i. HANNAH PARRY (Source: John Winter-Lotimer. ), b. 1862.
ii. SARAH ANN ALBERTA PARRY (Source: John Winter-Lotimer.). iii. JAMES PARRY IV (Source: John Winter-Lotimer. ), b. 1866; d. Abt. 1925.
iv. MARY ELIZABETH PARRY (Source: John Winter-Lotimer. 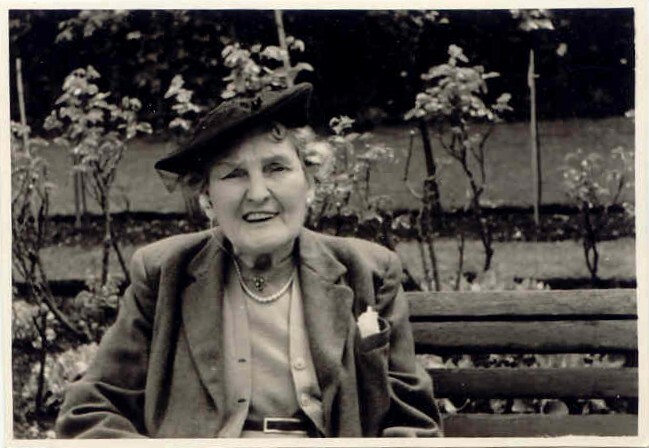 ), d. 1954.
v. FLORENCE GILBERTA PARRY (Source: John Winter-Lotimer. ), b. 1869.
vi. ALBERT PARRY (Source: John Winter-Lotimer.). GILBERT J PARRY (JAMES III, JAMES II , JAMES I ) was born 1844 in Chester, and died 1903. He married MARY BELL Feb 1873 in Coddington, Chester, daughter of REVD. THOMAS BELL. She was born 1844, and died 1928.
i. AGNES MARY PARRY, b. Feb 1874, 1874 Chester 8a 381 - tattenhall 1881 census; d. Jul 1957, birkenhead. ii. AMY LOUISE PARRY, b. 1875; d. 1963.
iii. GILBERT JAMES PARRY, b. 1876; d. 1961.
iv. ROBERT BELL PARRY, b. 1877; d. Abt. 1950.
v. LIONEL DALTON PARRY, b. 1879; d. 1941.
vi. NORAH SOPHIA PARRY, b. 1883; d. 1976. 3. AGNES MARY PARRY (GILBERT, JAMES III, JAMES II , JAMES I ) (Source: 1901 British census.) was born Feb 1874 in 1874 Chester 8a 381 - tattenhall 1881 census (Source: www.1837.com. ), and died Jul 1957 in birkenhead (Source: (1) Gavin Rowden, http://www.rowdensurname.org/., (2) The Times newspaper - Deaths.). She married (1) ALFRED HENRY READ (Source: 1901 British census.) Sep 1895 in Chester 8a 646, son of ALFRED READ and EMILY MUSGRAVE. He was born Jul 1871 in Georges Road, West Derby, Lancs, and died Aug 1955 in The British Hospital, Lisbon, Portugal. She married (2) ZORO INNES BRADBURY (Source: 1881 British Census.) Oct 1917 in Register office, West Derby, Liverpool (Source: Marriage Certificate. ), son of GEORGE BRADBURY and ELIZA INNES. He was born Mar 1877 in Princes Rd, Toxteth Park, Liverpool (Source: Birth certificate. ), and died Oct 1939 in Lansdowne Nursing home, Blundell sands (Source: Death Certificate.). i. WINIFRED MARY READ, b. 1897.
ii. DORIS NESTA READ, b. Apr 1899; d. Jan 1994, Hatfield Peverel Lodge, Crabbs Hill, Essex. iii. PHILLIS ALFREDA READ, b. 1901.
v. INNES GEORGE BRADBURY, b. Aug 1918, Poplar Ave, Great Crosby; d. Feb 1988, Southport, Merseyside..
4. DORIS NESTA READ (AGNES MARY PARRY, GILBERT, JAMES III, JAMES II , JAMES I ) (Source: Gavin Rowden, http://www.rowdensurname.org/.) was born Apr 1899, and died Jan 1994 in Hatfield Peverel Lodge, Crabbs Hill, Essex. She married CHARLES BURGESS WINTER (Source: Gavin Rowden, http://www.rowdensurname.org/.) Dec 1921 in St James, Piccadilly, son of CHARLES WINTER and MARGARET DOVER. He was born Jan 1894 in Newcastle, and died Apr 1966 in Inver Cottage, Maple Walk, Cooden, Sussex. i. JOHN BURGESS WINTER-LOTIMER (Source: Gavin Rowden, http://www.rowdensurname.org/.). ii. JUNE DORIS WINTER-LOTIMER, b. 1928, Thickwood, Elmstead Lane, Chislehurst, Kent. 5. INNES GEORGE BRADBURY (AGNES MARY PARRY, GILBERT, JAMES III, JAMES II , JAMES I ) (Source: Birth certificate.) was born Aug 1918 in Poplar Ave, Great Crosby (Source: Birth certificate. ), and died Feb 1988 in Southport, Merseyside. (Source: Death Certificate.). He married (1) LIVING SPARKS (Source: Birth certificate.) Sep 1939 in Crosby, Lancaster (Source: Marriage Certificate. ), daughter of REGINALD SPARKS and HILDA KING. She was born 1917 in West End, Chobham (Source: Birth certificate.). He married (2) MARY BIBBY Mar 1959 in Register office, Liverpool South. (Source: Marriage Certificate. ), daughter of JOHN BIBBY. She was born Abt. 1909. He met (3) HELEN MARGARET WAGSTAFFE in Formby. She was born Abt. 1924.
ii. LIVING BRADBURY, b. Sep 1941, Southport.